For many Christians, the opening passages of the Bible that relate the creation story have been interpreted as clearly saying that God made the world perfect and, when sin entered the world following the Fall, that perfection was marred. Such a reading of this text makes sense on first appearance, both theologically and philosophically. If God is God, why would this Creator of the Universe make a world that is anything less than perfect? 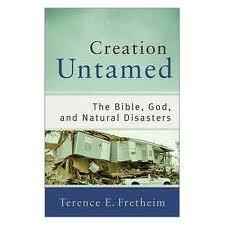 However this is where Fretheim demolishes this argument with clear biblical insight. Fretheim backs this view up with a quote from none other than the German theologian Jurgen Moltmann, who has said that “God does not create merely by calling something into existence, or by setting something afoot. In a more profound sense he `creates’ by letting-be, by making room, and by withdrawing himself.” In other words, God does not micro-manage the universe. One of the theological points I struggled with in the book was Fretheim’s use of the term ‘divine council’ as being involved in the initial creation act. Genesis 1:26has God saying “‘Let us make humankind in our image, according to our likeness”. I have always interpreted the ‘our’ in this to refer to the Trinity – the ‘eternal community’ as Larry Crabb puts it. As God is relational, it makes sense that the creation would occur as a result of relationship. Fretheim however appears to see the ‘us’ and ‘our’ differently. He states that “a remarkable majority of scholars understand…the divine council [in terms of] the heavenly assembly that engages the deity and does God’s bidding.” I put this issue to Fretheim, additionally pointing out that when he talks about the creative activity of God, he says that “all that it means to be divine must be at work in the creating of that image. This reality may be reflected in the use of the phrases ‘our image’ and ‘our likeness.’” However, because we are made in the image of God, and not in the image or likeness of that which is not God, this seems to contradict Fretheim’s previous statements about the divine council being involved in the creation, unless the divine council – those beings that are created by God – are also divine, which would be unscriptural. It would seem to me that the ‘us’ in ‘Let us make’ is the same as ‘our’ in ‘our image’. Fretheim responded to this question by saying that the “us, our” can include the divine council without compromising monotheism or “image of God” language. He adds that it is not uncommon that angelic beings make an appearance in human form and they too are in the image of God. Jurgen Moltmann, God in Creation: A New Theology of Creation and the Spirit of God (Minneapolis: Fortress, 1991), 88. Lawrence J. Crabb, Connecting (Thomas Nelson, Nashville, 1997).